A couple of weeks ago I traveled to St John in the US Virgin Islands for a family vacation. 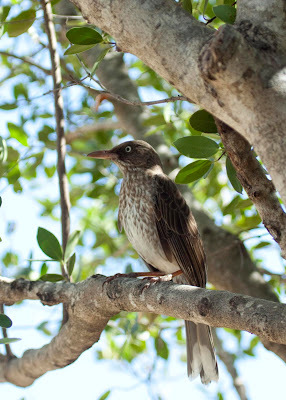 I had never birded in the Caribbean so I was extremely excited to get to the island and find a few lifers. 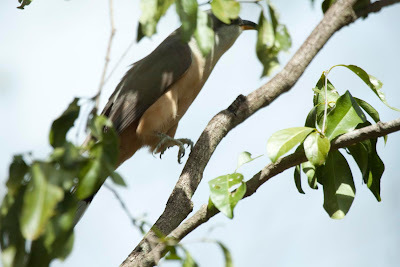 While St John has no endemic species, there were many Caribbean specialities for me to find. It was dark when we arrived on the island so my search for lifers had to wait until the next morning. I got up really early and decided to spend the morning birding around the hotel property. Right as I stepped outside, I noticed a hummingbird on the flowers just outside our door. 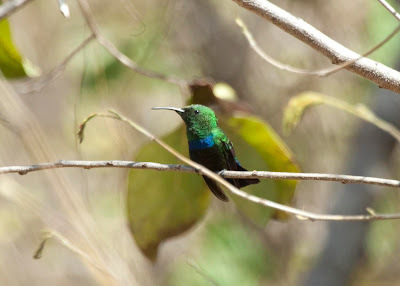 It was an Antillean Crested Hummingbird and my first lifer of the trip. My next lifer came quickly in the form of the ever present Pearly-eyed Thrasher. This bird is everywhere on St John. Those were my only lifers that morning but I was more than happy to spend my time watching the many Bananaquits around the property. 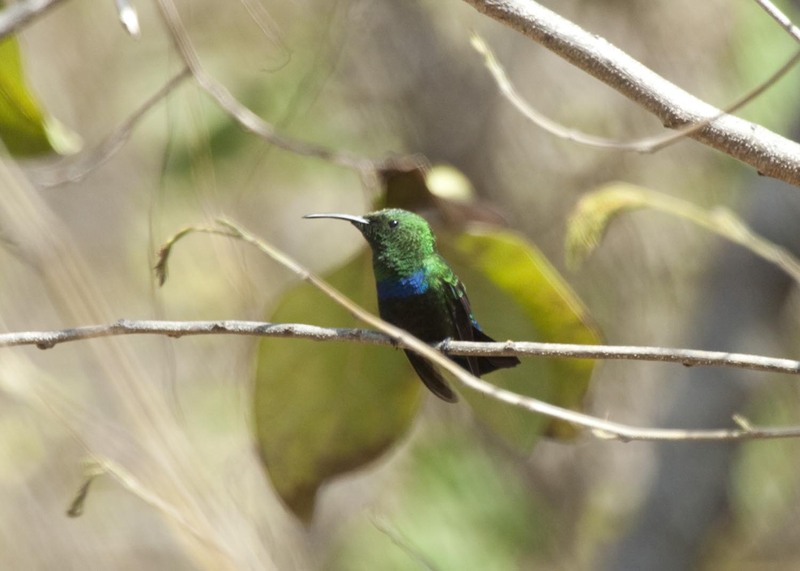 Later in the day while we were walking around Cruz Bay (the main town on the island) my wife found me another lifer on a hummingbird feeder, a Green-throated Carib. Most of my birding over the next few days was just incidental while we were busy exploring the island. During this time, I was able to watch Brown Boobies quite closely while we were on a sailing trip to the British Virgin Islands. It was fun to watch the Boobies and even more fun to swim ashore in a few locations and have some rum drinks! On Wednesday, I finally got out to do some real birding. My wife and I took a taxi from our hotel to the Francis Bay Trail. It turns out that this is some of the best birding on the island and was hosting a special visitor that we were unaware of. Almost immediately after starting down the trail I picked up my first lifer and a bird that I have looked for many times, a Mangrove Cuckoo. While we were standing on a platform overlooking a pond and watching my lifer White-cheeked Pintails, a man walked up and asked if we had seen "it". We explained that we were just visiting the island and had no idea what "it" was. 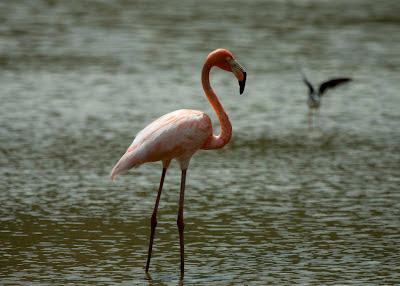 he told us that there had been a single American Flamingo around the pond for the past week and that it had even made the front page of the local paper. We would be sure to keep an eye out for this bird! We kept on birding around the pond and picked up a couple more lifer including Smooth-billed Ani and Black-faced Grassquit but still no flamingo. As we headed back towards the trailhead we stopped at an overlook that had a nice view of the pond below but part of the pond was still hidden by the trees. It looked like it would be easy climb down 15 feet to get a better view. I didn't even have to go that far before I noticed a huge pink bird on the far side of the pond. We moved back down the trail and took a small path through the mangroves to the waters edge. It turned out that this put us within about 25 yards of the flamingo. On our last full day on the island, we went to the far eastern end of the island to try another birding location called Salt Pond. Unfortunately, this was not nearly as good for birding as the Francis Bay Trail. 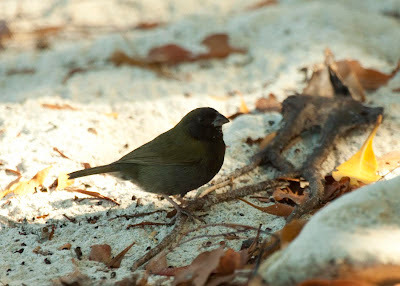 The birding highlight of the day was photographing a Black-faced Grassquit. I had a great time exploring a new area and learning a lot about some of the more common Caribbean species that I was not familiar with. While I would not travel to St John strictly for birding, if you are going there for vacation, you can definitely squeeze in some productive birding time. Rob, Birding St John sounds like a lot of fun to me. 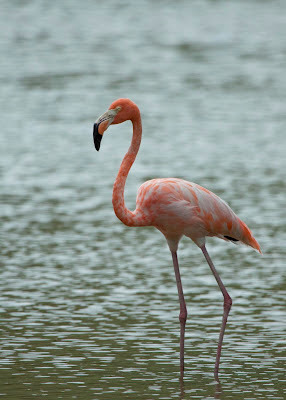 How nice about the Flamingo! Looks like some great birding in St. Johns! Great variety of interesting birds!! Sounds like you had a wonderful vacation and viewed some beautiful birds. Congratulations on all the lifers! That Green-throated Carib Hummingbird took my breath away ... gorgeous! 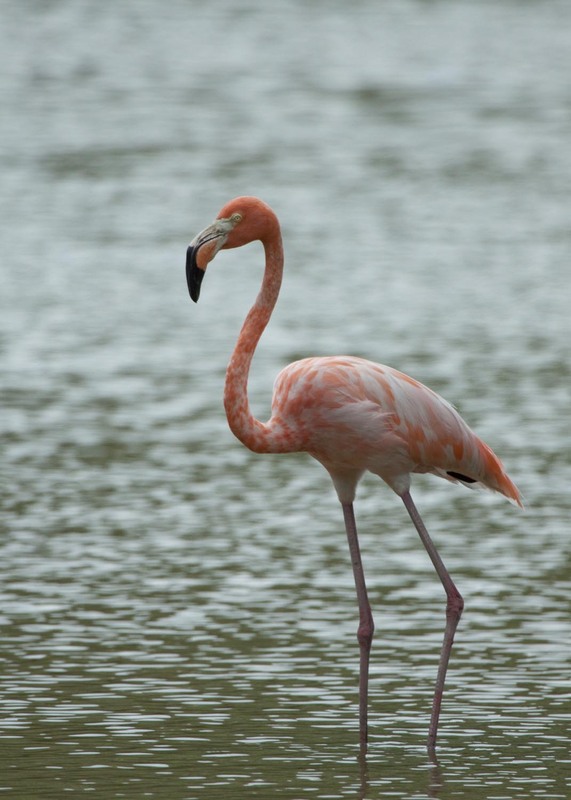 Stunning American Flamingo! Exotic! It must be great to arrive in a new place and have virtually every bird be a new bird, especially when they pack so much color. Thanks for bringing back some photos to share. Birds are stars dancing in the sky.